Spoiler Alert: If you haven't read this series then this review may reveal plots of the previous books. Jace has disappeared, along with Sebastian, from the rootop. The search for him is met with little result. In desperation, Clary decides to take action herself. However, her joy dies when she realises Jace is bound to her brother, Sebastian, with the blood of Lilth. Along with her friends, Clary embarks on journey to save not only the boy she loves but also the Shadowhunter world. Welcome back to the world of Shadowhunters and the constant obstacles that Jace and Clary face during their relationship. The latest instalment was met with anticipation after Cassandra Clare had left fans on a cliff in City of Fallen of Angels. City of Lost Souls certainly explains what happens to Jace and Sebastian after the rootop incident but seems to centre on the romance of the characters in the novel. It does come across as quite frustrating, the lack of the original plot of the series. What was once a battle between Valentine and Shadowhunters has now circulated to just the relationship between Jace and Clary, and also the other characters. Yes, they are important as well but I wanted a lot more badass fighting scenes and 'good vs. evil' moments. Not to say that there isn't, it's just limited. Clare tries to add those elements of the supernatural one but they seem more like snippets, that flitter in and out, and almost confuses the entire storyline. However, because Clare is able to establish such strong bonds between her characters and readers, it is easy to fly through the entire story. I read it all at once. There are times when you get tired with the constant intimate moments between the couples (almost inappropriate for readers under the age of 15), but you are kept on the edge with wanting to know who is good or bad, and what will become of Jace. Clare can produce suspense and readers will go along with the ride. It is only once you reach the end that it feels like the fifth instalment is quite unnecessary. What was once a promising trilogy, it seems as though The Mortal Instruments series is going with the hype, and has now extended to more of a romance series then anything. The series seems to have lost the original plot but overall, is still enough to keep diehard fans from continuing on the adventure. At least until the last book. I am a fan of the series, just not the last two additions. 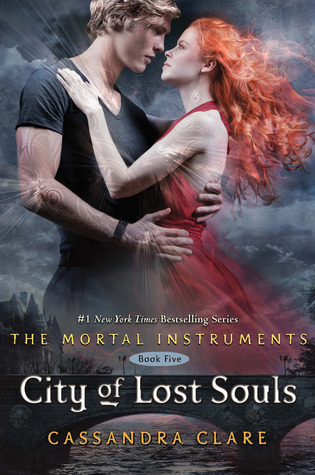 City of Lost Souls is not the best of the series, it's just okay. There are some shocks and twists to it but it will mostly suit fans of Clary and Jace who will love the amount of time focused on their relationship.